The Distinguished Service Medallion is mounted in red velvet and framed in a wood presentation. It reads "GOVERNOR'S DISTINGUISHED SERVICE MEDALLION, COMMONWEALTH OF KENTUCKY, UNITED WE STAND, DIVIDED WE FALL". It is undated. Condition: The mount is slightly loose in the frame. 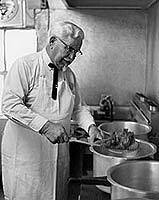 Colonel Harland Sanders' secret recipe to a well-lived life included giving back to the community and helping those in need. This year, KFC will honor his legacy by raising money to feed the hungry through the auction of items from the "Colonel Sanders Collection" found in a Louisville, Kentucky vault. For approximately one dollar a day, WFP can provide a meal to four children through its global school meals program. All funds raised in the US will be donated to WFP USA, a 501(c)(3) US charity, which supports the programs of WFP. For more information about WFP USA, visit wfpusa.org/about. All funds donated by customers during World Hunger Relief will directly support the greatest needs of WFP's food assistance programs in vulnerable communities around the world. WFP does not endorse any product or services. Give $1 and feed 4 children or to give $5 text "KFCWHR" 90999. Mobile donations of $5 will be charged to your mobile bill. Standard message and data rates apply. Go to mGive.com/A for terms and help. Charitable donation opportunity is only available to users of phones registered through US service providers. The Yum! Brands Foundation will make an additional contribution in addition to those funds raised by Yum! Brands and its restaurant brands to cover a minimum of US $1M and maximum US $2M in WFP's global administrative fees. ©2013 Yum! Brands, Inc. KFC Feeds is a program of the Kentucky Fried Chicken Foundation, an independent 501(c)(3) charitable organization funded by the KFC family of restaurants, and its logo is used with permission. Feeding America is a nationwide network of more than 200 food banks that leads the fight against hunger in the United States. Together, we provide food to more than 37 million people through 61,000 food pantries, soup kitchens, and shelters in communities across America. Feeding America also supports programs that improve food security among the people we serve; educates the public about the problem of hunger; and advocates for legislation that protects people from going hungry. Individuals, charities, businesses and government all have a role in ending hunger. Donate. Volunteer. Advocate. Educate. Together we can solve hunger. Visit feedingamerica.org. Find us on Facebook at facebook.com/FeedingAmerica or follow us on Twitter at twitter.com/FeedingAmerica. 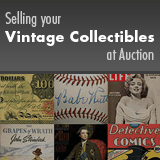 This charity auction lot is consigned by a corporation or individual with all proceeds to be donated to a nonprofit. Please consult your tax professional to determine any tax-deductible amount.